As the angels sing ‘Glory to God in the Highest’. Our son was listening at a distance as his four year old daughter told the Christmas Story to another four year old, using a picture book. ...“and then these angels came. So the paddock people went to see the baby Jesus for themselves..!” she exclaimed with much delight. The little one can’t read yet so shepherds do look like people living in a paddock. It is wonderful that she knows already how special is Jesus. The Christmas story reaches everyone. All generations are covered. All cultures too. We have at home Nativity sets from every continent, culturally distinct yet each drawing us to focus on the Christ - child in the manger. Jesus is God’s invitation to the world to live in love together: One human family, gifted with life, together on a tiny planet in a vast universe of divine creation. A child can grasp that to love one another in the way and spirit of Jesus, is the deepest truth. “God is love and those who abide in love abide in God and God abides in them”. (1 John1:16). As we gather for Christmas, we know how much love is needed to give many people healing and hope. (NB. 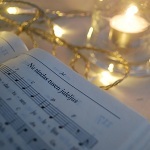 In the Western Church, Christmas is celebrated on 25 December2018.